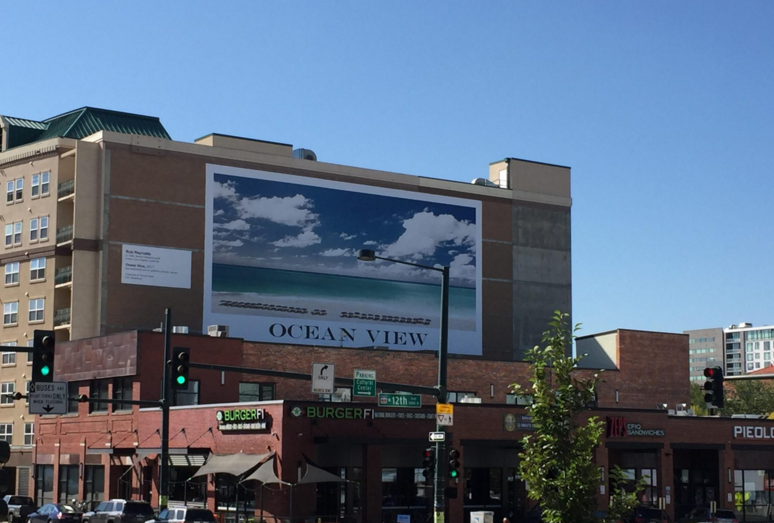 “An Ocean View for Denver” stretches about 100 feet on the side of a residential building on Broadway near 12th Avenue. “An Ocean View for Denver” is an insider piece of art with outside appeal. Rob Reynolds’ massive work — about 100 feet wide and more than 40 feet high — hangs in public view on the side of a residential building on Broadway, just across 12th Avenue from the swank hotel known as The Art. The location is no accident. The story behind it, and it’s very Denver, goes like this: Lanny Martin, the legendary local philanthropist and a partner in the hotel, was having a conversation with Dianne Vanderlip, the legendary local art curator who decorated his establishment. It came up, in passing, that the only amenity the place lacked was an ocean view. That, of course, is nothing that a wealthy guy with expensive taste in art, working along with a curator with contacts across the planet, can’t fix with a phone call. So, Vanderlip placed one — to Reynolds, who is already in the hotel’s vast collection and whose mixed-media work has often incorporated a variety of ocean images. A deal was struck and Martin got his vista. But so did the rest of us. The piece, set high up along one of the city’s busiest traffic corridors, is visible from a block away. And it’s really not so insider. Reynolds created something that’s less of a postcard and more an exploration of the concepts and boundaries of earthly utopias. His piece is a mesh of various found images of placid beaches, though instead of relying on glamorous stock photos from the Riviera, he looked for more democratic scenery, borrowing from “the most generic possible types of sources” he could find. In this case, that meant advertisements for second-tier, time-share developments. The sand and sky here come from various places — the Mediterranean, the Bahamas, Northern Florida and more. There’s a bit of ocean view snatched from every travel budget. Reynolds didn’t stitch it together so neatly. The perspective shifts awkwardly at times, revealing its multiple sources. The piece is rendered so that it has the half-tone color treatment of a printed magazine or real estate brochure. That makes “An Ocean View for Denver” a series of contradictions — a piece of fine art modeled after mass media; an amenity for an exclusive hotel that dwells in the downscale world of public art; a portrait of serenity that actually can be quite jarring. The work is relentlessly aware of itself. First, it features its own name as part of the piece, written along the bottom in an antique engraver’s font that is reminiscent of typefaces popular around the time of Denver’s founding. Reynold thinks of the obviousness and prominence of the title as a homage to the popular contemporary artist Neil Jenney, who often incorporates unnecessarily descriptive text into his work. Second, it is accompanied by a separate label that is placed on the brick wall next to it — noting the artist’s name and the media he used — that is curiously large and detailed. It is, of course, part of the work, reminding viewers they are looking at art and not an ad for soft drinks or airplane tickets. “The piece is really the entire wall, and the art card is a super important part of it,” said Reynolds. The label is also a nod to the neighborhood. The Art hotel is located in the Golden Triangle, the cultural district that includes the Denver Art Museum, the Clyfford Still Museum, the History Colorado Center and other institutions. Museums take their labeling seriously, practically considering it an art form unto itself. “An Ocean View for Denver” has some fun with that, but the gesture also elevates the piece from a simple oversized banner, something Denver has a lot of these days, into a thoughtful installation. It comes along at an interesting time, presenting an idealized view of coastal beauty at a time when natural disasters are wrecking islands and beaches across the hemisphere. That may be a coincidence — the idea was conceptualized more than a year ago — but “An Ocean View for Denver” actually lives up to the moment. It presents a rich view of all that sand and infrastructure that’s been destroyed lately in Puerto Rico, Texas, Florida and throughout the Caribbean. It cuts across geography, economics and culture, reminding us of the enormity and diversity of what is lost. “An Ocean View for Denver” is meant to be a permanent work, but, no doubt, it will be lost one day, too. It is printed on a polymer material that is UV resistant and colorfast, but it will face the tough combination of Colorado sun and snow and eventually will succumb itself, whether that’s “three days, three months, three years or three millennia,” as Reynolds puts it.